A bronze statue of the "Dough Boy, Ready," commemorating the boys of the Texas Panhandle who served in World War I, was erected on the grounds aside the auditorium. 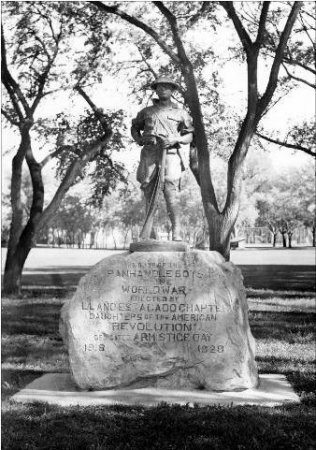 It was dedicated and presented to the American Legion on Armistice Day, November 11, 1928 by the Llano Estacado Chapter of the Daughters of the American Revolution, Amarillo.2 "Doughboy," was a nickname given to American infantryman fighting in the trenches in Europe. 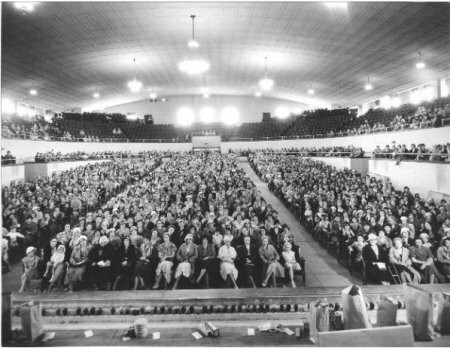 According to Billboard Magazine, a tour arranged by Bob Neal consisting of Elvis, Ferlin Huskey, Martha Carson, the Carlisles, Jim Ed and Maxine Brown and Onie Wheeler that began with a matinee in Fort Worth, TX on May 29, 1955, was also booked by Al Rogers for performances at Amarillo's Auditorium on June 2nd.4 However, no advertisement or review can be found in any of Amarillo's newspapers in weeks leading up to or after to confirm that the performance actually occurred. 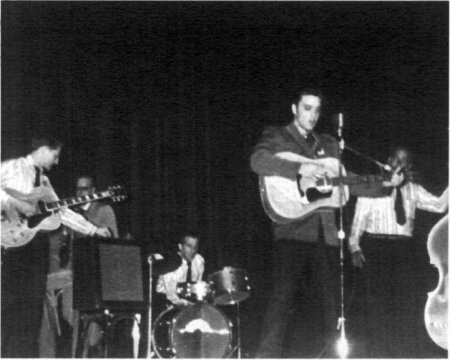 On October 13, 1955, Elvis, Scotty and Bill did though perform at the Auditorium. 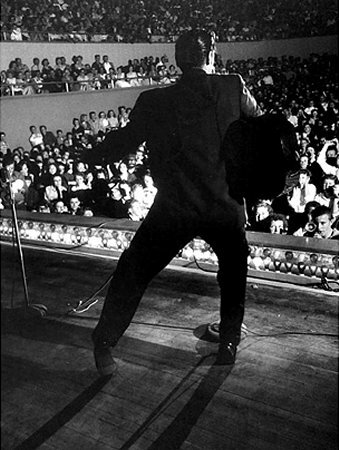 The show also included another Sun recording artist, Johnny Cash. The 20-year-old "king of western bop," Elvis Presley, will appear in person at the Municipal Auditorium at 8 p.m. Thursday. With him in the show will be Wanda Jackson, Jimmy Newman, Porter Wagoner, Jimmy Day, Johnny Cash and Bobby Lord, all recording artists. Presley has gained fame through his combination of folk music spiced with a rock 'n roll beat. 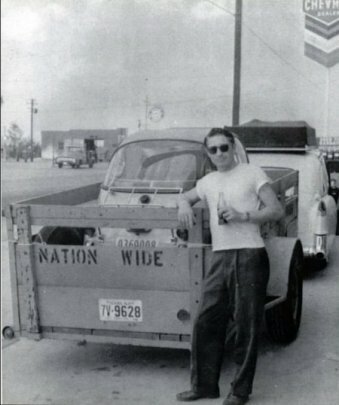 A native of Tupelo, Miss. he moved to Memphis, Tenn. with his family when he was 12 years old. 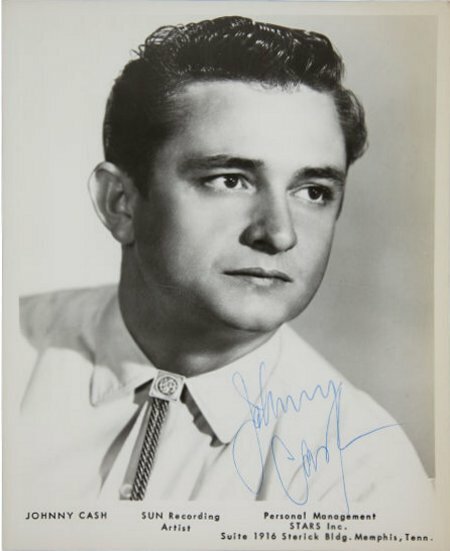 His first real recording work came after the Sun Record Company officials of Memphis heard him and signed him to record "That's All Right" and "Blue Moon of Kentucky." He began his career with the Louisiana Hayride in Shreveport and has made personal appearances in Texas, Tennessee, Arkansas, Florida and Virginia. 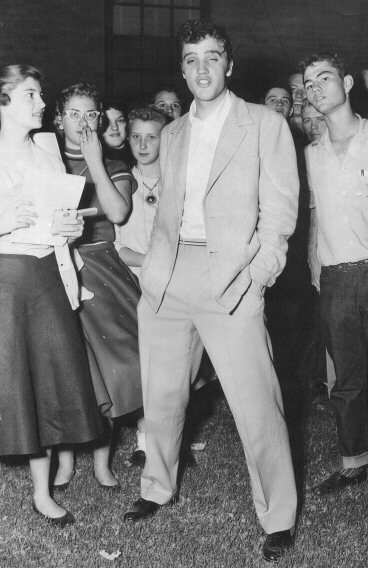 Presley's wardrobe runs to the "cool cat" type of dress rather than western apparel. Tickets for the show are on sale at Cooper and Melin, Panhandle Radio & TV and Radio station KZIP. 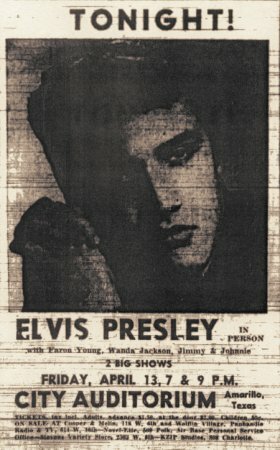 A more condensed version of the same write up by Patsy appeared on page thirty of the Amarillo Globe times on October 13, the day of the show, where she continues to describe Elvis style of music as "western bop." Bobby Lord was a regular on the Ozark Jubilee and eventual Grand Ol Opry star, as was Porter Wagoner. Jimmy C. Newman was another star of the Hayride that would move to the Opry. Jimmy Day was a steel player who had appeared with the band several times and on occasion performed with them. He would go one to become a renowned player in country circles. Floyd Cramer, would record with the band the following year in Nashville after Elvis signed with RCA and in addition to a recording career would be a much sought after A-Team sessionist. 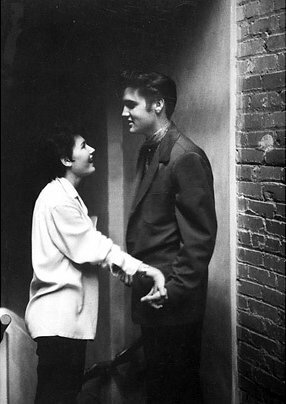 Wanda Jackson had shared many dates with Elvis and at his urging began singing rock 'n roll. 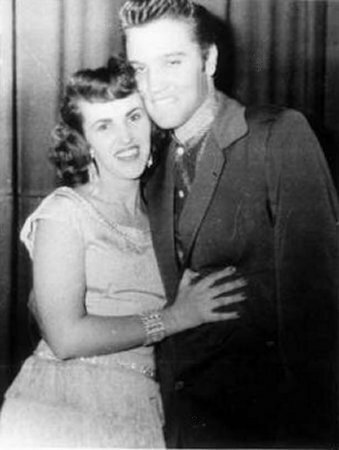 She would also appear on the bill the next time they performed at the Auditorium in Amarillo, on April 13, 1956. 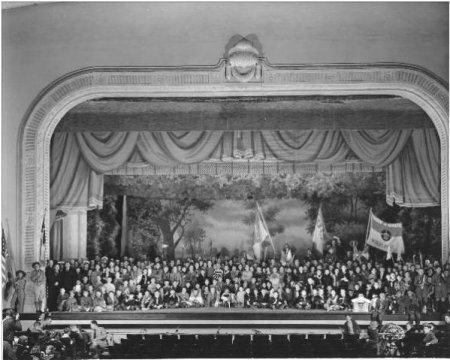 By then Elvis had performed on the Dorsey Bros stage show on National Television and a little over a week earlier had made his first appearance on the Milton Berle show from the deck of the USS Hancock. yesterday, these fans of Elvis Presley waited on the steps for the doors to open. Teenagers crowded into the auditorium for both performances. A sleepy-eyed ex-truck driver undulated sensually against a stage microphone -- and thousands of teen agers rocked, rolled, shrieked and squealed. 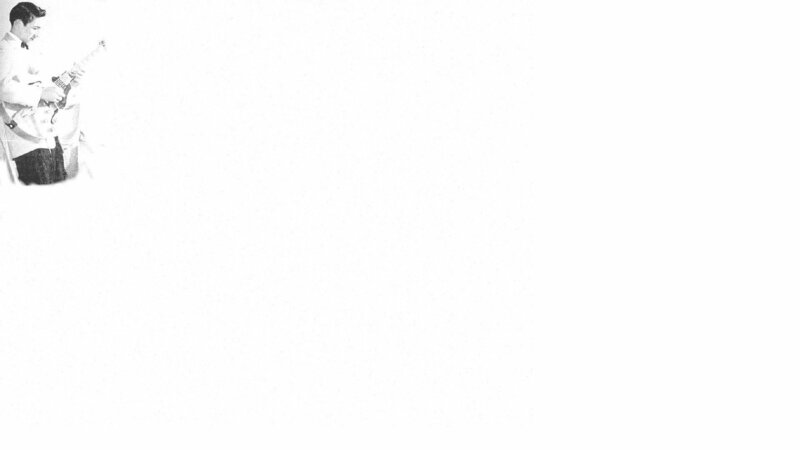 He lists his profession as "singer." But Elvis Presley earns his couple of thousand dollars a night arousing throngs of teen-age girls to fever-pitch excitement. 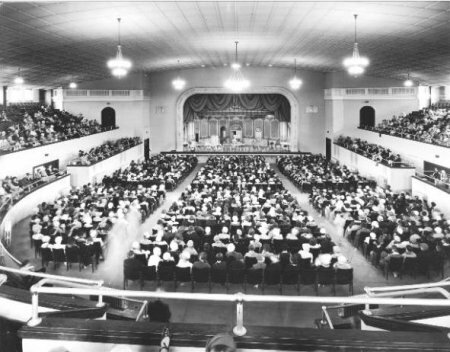 Elvis Presley drew a full house at the Municipal Auditorium twice last night. Teen age girls dominated the crowd. Elvis Presley drew a full crowd began screaming. The soprano wails of delight rose the minute he appeared. He worked himself into an orgiastic rhythm, losing himself to the savage beat of his own guitar and his accompanying band. 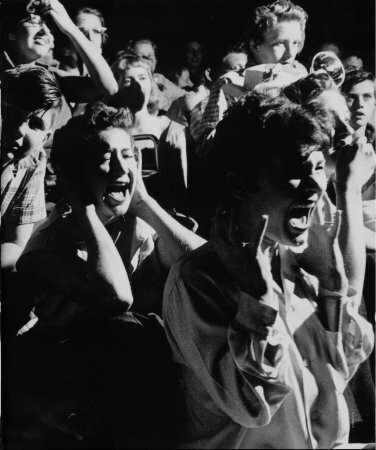 The air raid - siren scream of the crowd heightened as Presley's bumps and grinds grew more frantic. He set a rhythmic pattern in his first song that he pursued for each succeeding number. What he sang didn't matter. The fascination was the provocative gyration of the singer, lighted by blue-and-red footlights. The teen-age girls swarmed toward the stage, filled the aisles, lined the walls-drawn to the man who was throwing himself around on stage. Stimulated by this sight and overcome by the beat, the little girls, too, set a pattern for their reactions. They giggled at the start of a song. They screamed. They stared wide-eyed. Some clenched their fists and closed their eyes--others covered their faces with their hands --at the climax of each song. 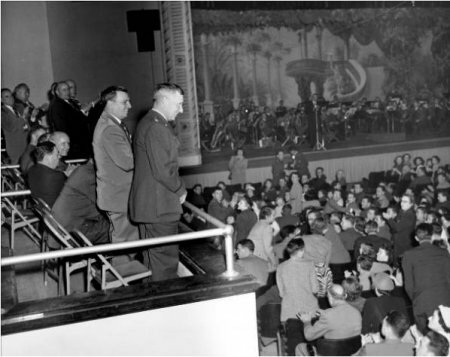 Photo by A. Y. Owen courtesy Joseph A. Tunzi's "Photographs And Memories"
Overwhelmed by the emotion let loose in the auditorium, the crowd swelled out after the first show to mob the stage entrance for a view of their idol. 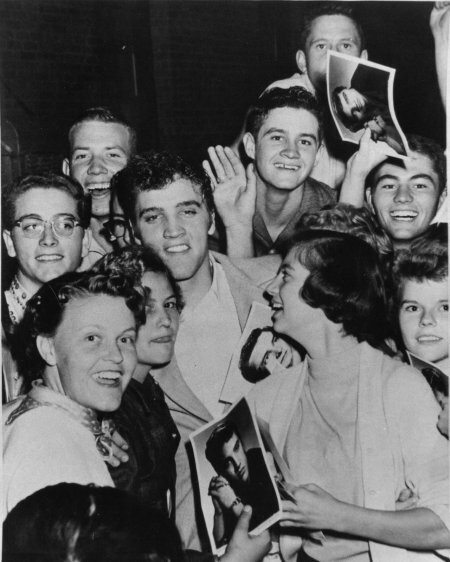 Because a Life magazine photographer was covering his performance, Elvis had consented to sign autographs. Only a minute or two after the curtain for the first of two performances last night, a near riot mushroomed at the stage door. Having smashed an entire front door of the Municipal Auditorium at 5:30 p.m. yesterday, the Presley fans set to work on the stage door. One pane of glass went out before Presley reached the backdoor for his autograph party. 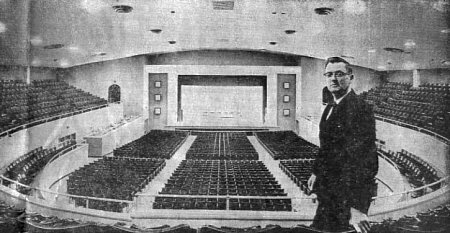 Members of the Amarillo Police Department and Auxiliary Policemen had been stationed around the auditorium to attempt to control the mob. (Its Presley's police-escorted exits after his shows that have started the rumors of his being jailed--in San Diego, San Francisco, Lubbock or anywhere that he has appeared). Waiting for Presley to appear the stage -door gang set up a chant of "We want Elvis!" He finally appeared -- in his mandarin-collared gray pink silk shirt, cerise swing-back jacket, black trousers and black moccasins. The girls gave out a scream. Policemen tried to take the jagged glass from the frame of the broken pane. The extraction was only half-successful. for about 15 minutes little girls thrust their hands through the jagged hole in the door. some of the teen agers were cut -- that, too, seemed to be a thrill. Presley signed for programs, photographs, autograph books, lipstick-blotted napkins. He tried to return the programs to their owners, but some of them were snatched away by bigger stronger girls. Presley even signed some of the girls' hands -- another thrill. The stagedoor throng had already trampled the hoods of a couple of Cadillacs parked at the stage door. Then they started to trample each other. Presley went back behind the stage curtains, hugged a nearby blue jeaned teen age girl, paced the floor, told a questioner that he doesn't plan to get married because "why buy a cow when you can get milk through the fence." Presley gave the teenage girl a long eye-to-eye stare apparently momentary mesmerism. He brushed from his forehead a few strands of his duck-tail-cut brown hair and flapped his long eyelashes. (Meanwhile the auditorium was filling up with a second houseful of rock 'n' roll fans). Presley said he likes his Cadillacs, but he likes his new three-wheeled Messerschmitt automobile better. But he never gets any time off--he's driven the new car only two days. Last night, after the shows, he was to fly to Nashville for a recording session this morning. Presley will play a two-week date at The Last Frontier in Las Vegas. Will he like that better than one night stands? He doesn't know. He says, "When I stay very long in one place I got restless--know what I mean?" He doesn't know the details of his movie contract. "Colonel Tom takes care of that," he says. "Colonel Tom," an honorary colonel named Parker, is manager for Presley and a string of other "country music artists." Presley wandered around backstage--restless. He limped. He limps, he explained, because he "kicked a table in the middle of the night while I was asleep." "You walk in your sleep, Elvis?" As Patsy Dinan had reported, Elvis, Scotty, Bill and DJ flew to Nashville that night to record at RCA's McGavock Street studio (nearly running out of fuel mid air). Elvis was presented his first Gold Record for Heartbreak Hotel and they recorded "I Want You, I Need You, I Love You." They rejoined the tour in San Antonio on the 15th. 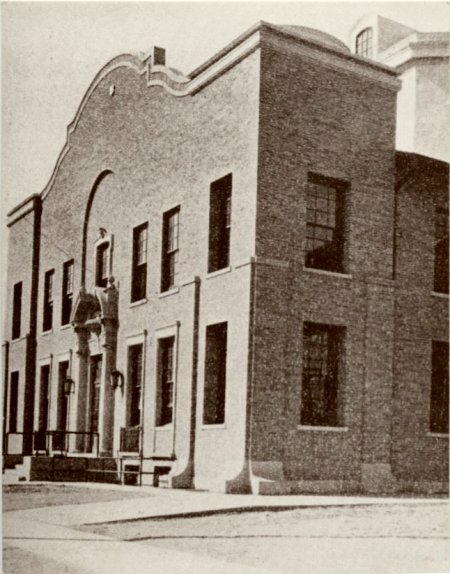 The "Dough Boy, Ready" monument placed on the grounds of the Auditorium in 1928 had been moved on June 24, 1966, and the marker was set on a concrete foundation at the northwest corner of Ellwood park.2 1968 also saw the closing and demolition of the Auditorium. 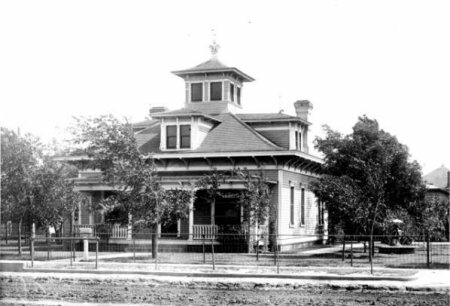 It was replaced by the Amarillo Civic Center. Special thanks to LaCreta Guy, nee Counts, from the Amarillo High School class of 1957 for the use of her photos taken by her sister Virginia, formerly of the Amarillo Globe-Times. 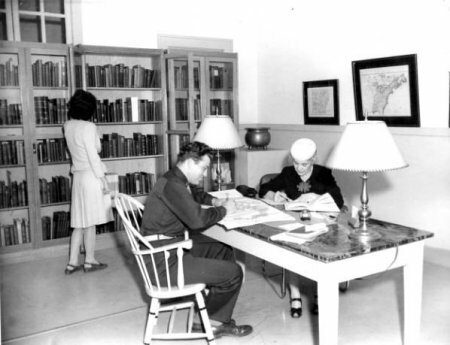 All Sunday Globe Times and Daily News articles and ads are courtesy Gayle Brown of the Special Collections Department, Amarillo Public Library. 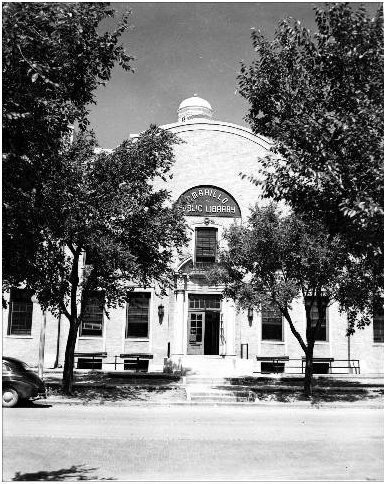 All Amarillo Public Library Photographs are used with permission courtesy Rob Groman of the Special Collections Department, Amarillo Public Library. 4 according to Billboard courtesy Ger Rijff's "Long Lonely Highway"
Course of Country Music Rocks 'N' Rolls! 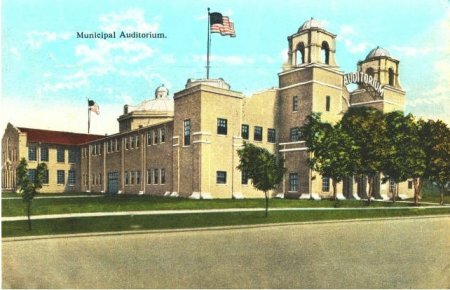 Mr. Presley will present two recitrals of western bop here at the Municipal Auditorium at 7 p.m., and 9 p.m. on Friday the 13th. This uninhibited 21-year-old guitarist-and-singer has few challengers to his title of "king of western bop." That is to say, he is the reigning champion of a type of music which can be described as a touch of western style mangled by a rock 'n' roll beat. MR. PRESLEY's BRAND OF MUSIC HAS acheived popular acceptance to the extent that his "Heartbreak Hotel" rides currently near the top of the nations's lists of "most-played" records. RCA-Victor records thought his services were worth $40,000 when RCA bought him from Sun Record Company of Memphis, Tenn., this past season. His first record album came out under the RCA imprint not long ago. One report has it that record stores in Amarillo have sold out on their first orders and are having trouble stocking enough of the albums. SO RAPID HAS BEEN MR. PRESLEY'S rise to fame that his appearance here Friday will cost bookers more than three times the fee he was paid when he performed here in October of last year. Also, Presley's show this week has broken records for mail order ticket sales and for andvance ticket sales, according to Ray Winkler of Radio Station KZIP. This station has been booking country music shows here for a couple of seasons now. Jackie Gleason thought Presley was good enough to book four times on his "Stage Show," one of Gleason's TV programs with which he fights Perry Como's TV show in the battle of viewer ratings. AN HONORARY COLONEL IN MADISON, TENN., TOM PARKER, who handles country-music talent, is Presley's booker. Colonel Parker has announced that Presley is breaking attendance records wherever he appears and that Presley has been invited to try out his talents on the motion picture screen. Presely's publicity writers state that he is "unmarried and has no serious intentions to become married . . . his main interests are his cars, a Cadillac Fleetwood sedan in a striking oink and black color and a pink convertible." His press agents mention that Presley is also "very proud of his mom and dad" and that he telephones them every day when he's away from the family home in Memphis. 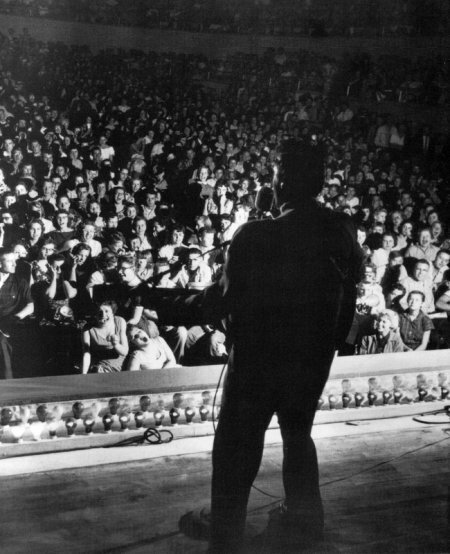 AS THE UNDISPUTED HERO OF THE bluejeans-and-leather-jacket teenage set, Presley has been regarded as a sociological phenomenon. It may be to his credit or discredit that he and his imitators have changed the course of country music. Its possible that the rock 'n' roll injected into country music shows those days is keeping the adult folk-music fans away from the "Grand ole Opry" type shows. 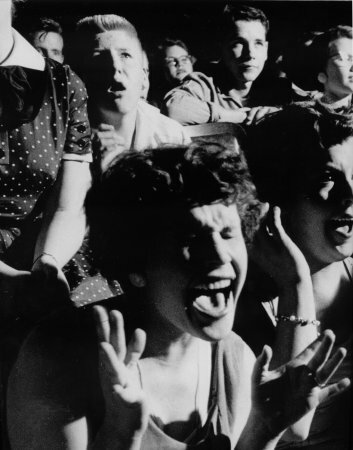 The teenage rock 'n' roll claque at country-music shows has all the earmarks of a mob--and is much less docile than the bobbysox swooners of the Frankie Sinatra era. Thes cool cats are real gone--or whatever the current terminology is. And unlike the bobby-soxers, this crowd includes boy teenagers, too.